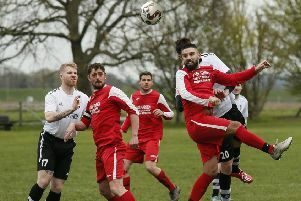 Ampthill Town’s only league game of the month brought little festive cheer as they lost 2-1 to Buckingham Athletic and played most of the second half with 10 men. With the side depleted after injuries took their toll in midweek, Town trailed to a 15th minute goal when the visitors capitalised on a mistake between keeper Steve Templeman and his defence. Town created half chances before Danny Butler’s run saw Dean Dummett fire in off the post to restore parity. Templeman tipped over a fierce shot late in the half, but was beaten by a header from a corner five minutes before the break as Buckingham restored their lead. Town pressed for the leveller in the second half when they had the lion’s share of the play, but the nearest they came was when Danny Butler hit the foot of the post after being set up by Charlie Cullen. Ampthill’s woes continued midway through the second period when Ed Skinner was sent off for a second booking, and they did not have enough in their tank to produce the equaliser. Town were due to go to Crawley Green last night (Wednesday) and they visit Chesham Reserves next Monday in a busy festive period.